Every now and then I get an email or a flyer that tries to appeal to my softer side. It says things like “theatre performers should go and see other people’s shows also” or “I saw your show, so come and see mine.” I try to get out and see as many shows as I can, but due to time and money, sometimes things don’t always work out. (Sorry Jillian, I really wanted to see your show. Srsly!) Most of the time the flyer is for a company that has a lot of support already. Today I got a note, and I would like to try and spread the word to help out this time. Lyric Theatre needs to sell 200 seats in the next 3 days!! If the seats aren’t sold, they stand to lose a large sum of money that could potentially affect their ability of producing a full season next year with all the bells and whistles. Their show “Oh Mr. Sousa” is a tribute to the music he penned. Nothing like supporting an American composer on the day before Independence Day!! For full details of the show please click HERE. I am asking that if at all possible to “Share” this post on Facebook or Twitter to help out our local arts scene. Thanks a million for your help!! 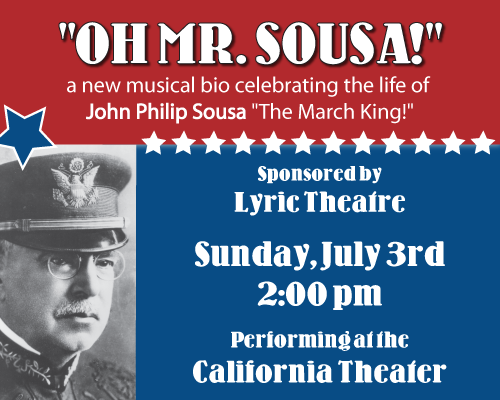 Posted on June 28, 2011 by theactorvistPosted in Blog PostTagged American composer, Lyric Theatre, Oh Mr. Sousa, San Jose.